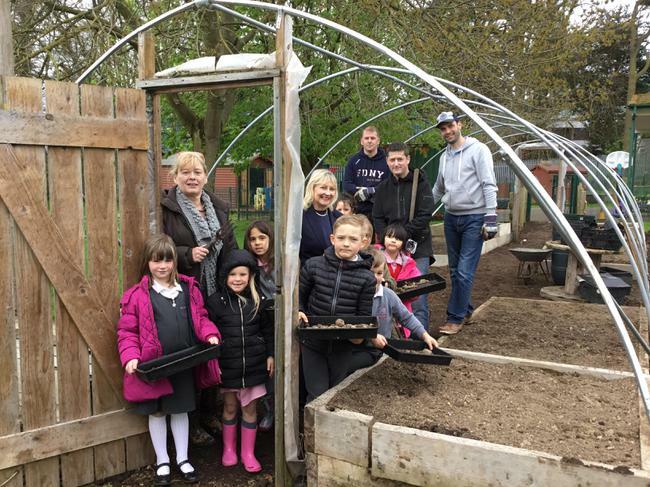 Chris,David and Michael, all staff from Tesco's Lisburn spent the day preparing our Polytunnel for the new cover being replaced. They dug out weeds, turned the soil and worked really hard all day. The P3 Explorers, along with some help from Mrs Jones gathered stones from the soil beds in preparation for new seeds being planted. The project was coordinated by Ann Broome, the Lisburn Tesco Community Champion. She helped the school raise funds through a bag pack in the Lisburn store to purchase the new cover. The volunteers enjoyed themselves so much, they are coming back to help complete the project! A big thanks to everyone at Tesco's, Lisburn for their support.